Stromberg offers you the largest selection of glass fiber reinforced concrete (GFRC), fireplaces to be found anywhere. 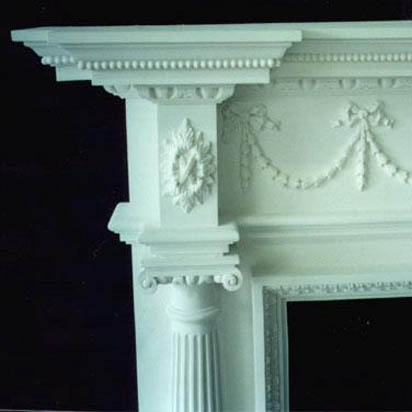 They come in a range of non-combustible materials that are safe to be used for a government fireplace. Stromberg can provide you with the world’s highest quality custom or standard fireplace. A mantel or fireplace surround from Stromberg in glass fiber reinforced concrete (GFRC), is a wise choice for a government building because of its built in safety factors. Made from minerals, GFRC is an earth-friendly material. It’s been extensively tested and found to hold up to many hours of direct exposure to heat without burning. No matter where in the building you’re going to put your fireplace, you can be assured it will be safe and last for many years. Glass fiber reinforced concrete fireplaces and surrounds can be made in any shape or size; Stromberg will work with you to find the perfect design from their stock, or they’ll create one you’ll love. GFRC is a combination of cement, glass fibers, aggregates and polymers which all work together to make it lightweight yet very durable. Since it’s so lightweight, the installation will be quick and easy. Your GFRC fireplace can be fashioned with a finish and texture that resembles natural stones like terra cotta or limestone. You can also have it made in an integral color or with a smooth finish so that it can be painted to match surrounding areas. GFRC fireplaces are available in many colors, finishes and textures. Glass fiber reinforced concrete is long lasting and durable. GFRC is reinforced with glass instead of concrete and so is rust resistant.